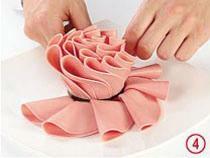 Food carving for beginners. In such a simple way you can decorate any salad! 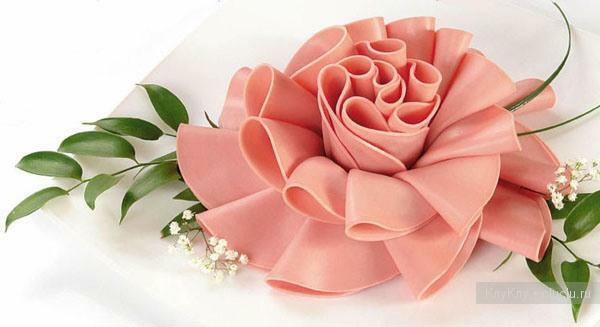 Surprise your guests with a beautiful flower made of sausage! 1. 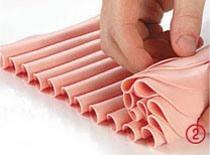 Lay out 18 folded in two slices of boiled sausage like a path. 2. 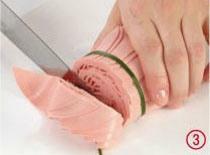 Roll up a cylinder out of these slices, beginning from the bend of the first slice. 3. The rolled cylinder tie in the lower quarter with spring onion. 4. Around the core lay out 12 folded in quarters slices of sausage. They'll be the lower petals of the «flower». 5. Open the petals of the core, decorate the «chrysanthemum» with greenery.